I found a Siberian ginseng on the web (1kg / 350Kč). Can you tell me if the price matches the quality or is it a "premium"? If I bought it, can I mix it with a ginseng, for example, to prepare tea? And one more question, I have a steady supply of 53% plum brandy for less money than medical alcohol, can I use plum instead of alcohol to make tincture? And how is it with mixing with 6 years or alternate use? Thanks for the answers. Alda. Thank you for your information, Aldo. The product photos of this eleuterokok gentlemen from the Salvia Paradise at a glance downloaded somewhere from the web. It has a poor resolution, and even the glued Chinese characters "c 'úcia" at the bottom right (so the Chinese call eleuterokoku). Despite the poor quality of the photo, it appears to be peeled wood material originating from small twigs (or roots) of a woody shrub by which eleuterokok (completely incorrectly referred to as the Siberian ginseng ) is - an eleuterokokové pinch. Otherwise you are the second to ask about this eleuterokok (by photo). Another reader - Martin - has also sent me his own photos with already exhausted Soxhlet extractor . 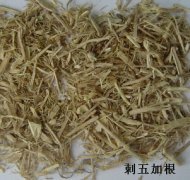 All the woody eleutherococcus drug we found here in Taiwan for use in the treatment of TČM came from the substantially thicker parts of the plant and looked completely different. Its price level will probably not be able to compete. That's not to say that the small diameter material would be bad. Although MSP prefers bigger and better looking parts of plants, I think the material on the picture you send may well be ok if it is clean and has no other problem.